Menna Elmindany rattles off the many reasons she’s looking forward to living in Roadrunner, one of three new apartment complexes opening this week at Grand Canyon University. The living room in the new Roadrunner Apartments allows plenty of space to relax. The apartment is roomy and brand new. Her roommates are friends — they’re like her family away from home. She’s eager to learn to cook in the kitchen. But the sophomore from Alexandria, Egypt, is most excited about having her own bedroom. “I’ve always shared a bedroom, with my sister and last year with my roommate. I can’t wait to have my very own room,” said Elmindany, a diver on GCU’s swimming and diving team. 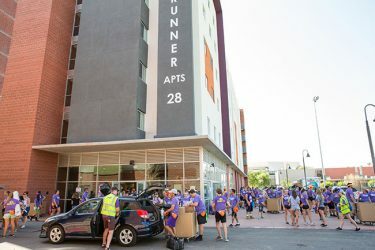 On Wednesday, Elmindany joined about 650 students moving into Roadrunner, one of three new apartment complexes opening this week at GCU. 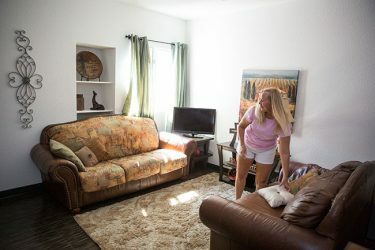 Returning full-time students had first dibs on Roadrunner’s three- and four-bedroom apartments, and several were relieved to make the cut. Students say they look forward to having their own bedroom for the first time. “I was on a waiting list and am so thankful I got in. I’ll love having my own bedroom,” said Travis Zumwalt, a sophomore finance major from Hawaii. Every apartment includes single-person bedrooms, two bathrooms plus shared living rooms and kitchens equipped with refrigerators, freezers, ovens, electric range tops and microwaves. Like many Roadrunner residents, Aaron Widger plans to fire up the stove in the apartment’s compact but well-equipped kitchen. “I love to cook, so am so excited I’ll be able to,” said Widger, a senior pre-med major from Tempe. Along with clothing and bedding, student volunteers were unloading sofas, tables, chairs, pots, pans and dishes Wednesday. 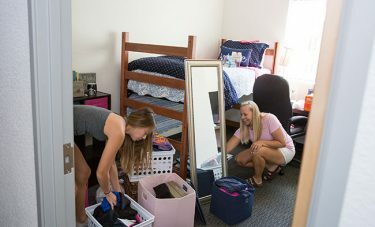 It was a busy scene as students moved in to the new Roadrunner Apartments. Elmidany and one of her roommates, Elizabeth Fogel of Santa Cruz, Calif., decided to move in with the bare basics and shop for furniture later. All three new apartment buildings are six stories and built in the same style as Papago I and II, which opened in 2014. Roadrunner is located in the middle of campus where the Tell Science building once stood. Agave is on 30th Drive north of GCU’s offices on Colter Avenue, and Encanto is just south of Papago II.